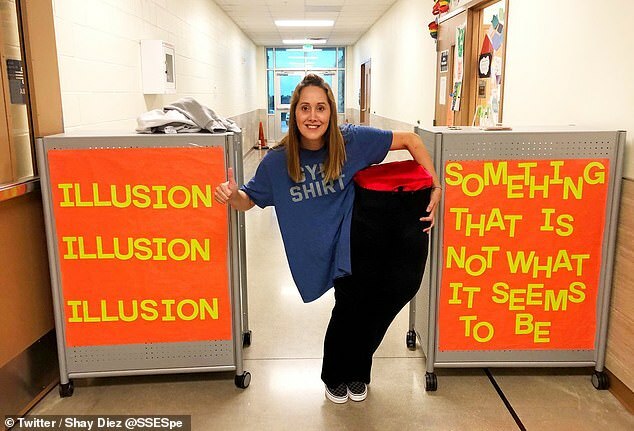 A Texas elementary school teacher has baffled social media users with her very creative Halloween costume. Shay Diez, 36, is a physical education teacher at Sycamore Springs Elementary School in Dripping Springs. To celebrate Halloween with her students this year, she dressed up as an ‘illusion,’ making it look like her body was cut in half. The mind-boggling costume appears to show the bottom of her torso and the top of her legs completely separated from one another. Though she wouldn’t reveal the secret to her creepy costume, a bit of Googling reveals a couple other people who have tried similar stunts, and seem to be bending their bodies at very odd angles to make it work.